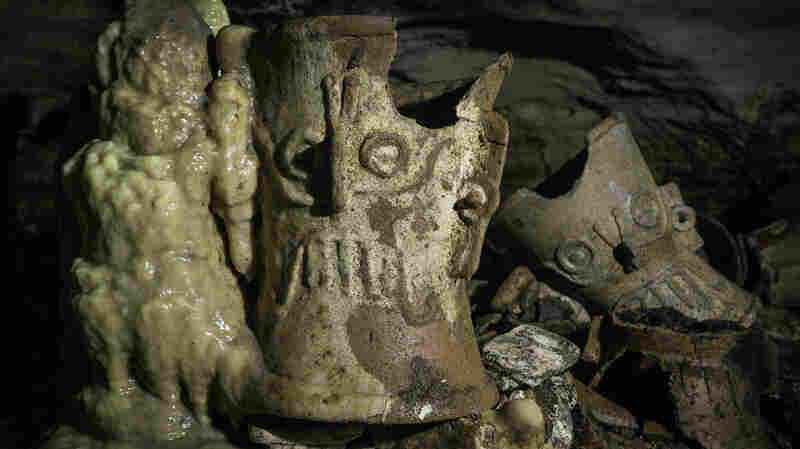 Archaeologists Find Trove Of Maya Artifacts Dating Back 1,000 Years The more than 200 artifacts were discovered in a previously sealed cave beneath the ancient Mexican city Chichén Itzá. Explorers had to crawl for hours to reach the archaeological materials. Archaeologist Guillermo de Anda checks out the third group of discovered archaeological materials in the cave. The discovery of the Yucatán Peninsula cave – and the artifacts, which appear to date back to 1,000 A.D. – was not the team's original goal, National Geographic Explorer Guillermo de Anda, who helped lead the team, told NPR's Lulu Garcia-Navarro for Weekend Edition. A local resident told the archeologists about the secret cave, known as Balamku or "Jaguar God." It had been known to locals for decades and about 50 years ago some of them told archeologist Víctor Segovia Pinto about the cave, but he ordered it sealed for unknown reasons, causing it to be forgotten. This time, the explorers decided to search the cave chambers, which involved crawling on their stomachs for hours to reach the coveted artifacts. "When I get to the first offering, which is about an hour and a half crawling from the entrance, you know, the thrill that I feel, I started crying actually, and I realized I was in a very very very sacred place," de Anda said. He traveled alone in the cave for that first exploring trip. The archeologists were initially looking for a connection between flooded caves to try to access a cenote – natural sinkholes the ancient Maya believed were sacred and openings to the underworld – that is supposed to be under a main pyramid in the area, known as both El Castillo and the Temple of Kukulkan. 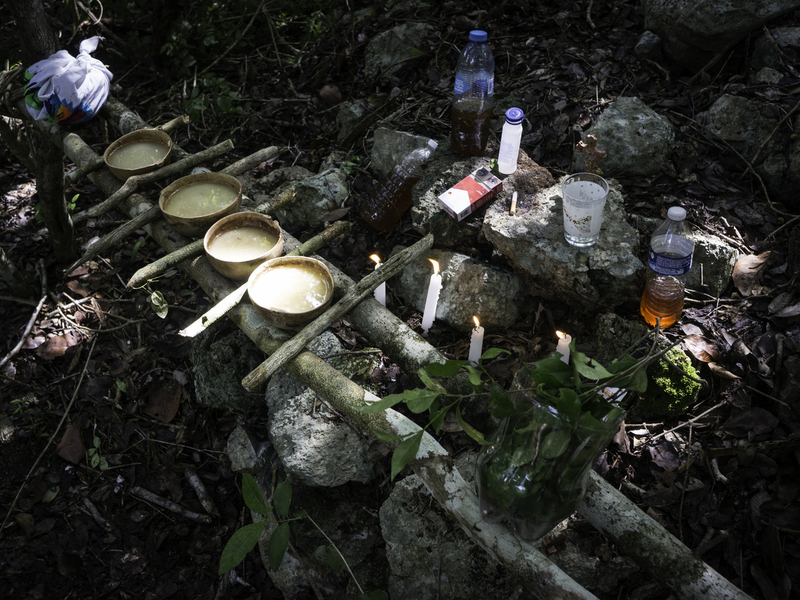 Before entering the cave system, the group performed a six-hour purification ritual with a Maya priest to ensure they would have a safe journey. The offering for the guardians of the cave is vast: honey, pozol (a fermented drink with dough), water and tobacco — a modern version with a box of Marlboro cigarettes. The discovered artifacts are in an "excellent state of preservation" and include ceramic incense holders, decorated plates, and other items. This collection may help researchers in their quest to learn more information about the rise and fall of the ancient Maya civilization. The archeologists' next step is completing analysis of the cave and artifacts, along with creating a virtual reality 3-D scanned model replica of the cave. And while de Anda, also the director of the Great Mayan Aquifer Project, said getting to the artifacts was a difficult task, it gave him a new respect for the Maya culture. "For us, it was very hard, but thinking about Maya in ancient times going there through those passageways crawling with a big incense burner and a torch – how they managed to do that – I mean, you have to think about them with even more respect than we have always had because you see how important these caves were for them," he said. Lindsey Feingold is the NPR Digital Content intern. NPR's Karina Pauletti and Viet Le produced and edited this story for broadcast.